Spring Sale! Sale ends on tax day: April 15, 2015. Spring Sale on HP Velotechnik Grasshopper recumbent bikes! Sale ends April 15, 2015! 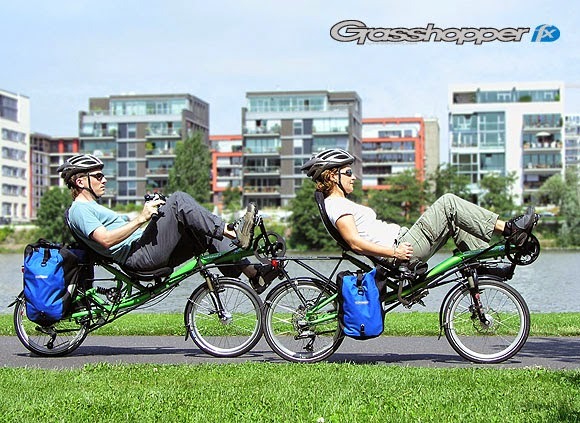 HP Velotechnik Grasshopper fx under-seat steering recumbent bicycles, custom built for performance and light weight. Sale price: US$ 4,399.00. Was $4,564. Save $165. Grasshopper fx (magic green or dark blue, your choice) with under-seat steering, hardshell seat, carbon fiber front boom, Rock Shox Monarch RL rear shock, MEKS SASO Carbon AC suspension fork, Shimano XT drivetrain with Dura-ace bar end shifters, AVID BB7 disc brakes. Price includes tariffs and duties. Order and payment must be received by April 15.